This experiment takes a few minutes to set up, but once done you can do the experiment over and over. My kids enjoyed taking turns making the scuba diver move up and down in the bottle. Step 1 – Cut out your diver using the same shape and size indicated above. I lightly sketched my diver on my foil before I cut him out. Note: That is a small paper clip. The diver should be approximated an inch and a half tall. Step 2 – Cut the straw and position it on the paper-clip as show above. Each end should be secured by the ends of the paper clip. Step 3 – Slowly slide the straw onto the diver as show above. The diver should look like he’s wearing a scuba tank. Step 4 – Place a small piece of play-dough or putty on the diver’s feet. Step 5 – Fill a glass with water and put the diver in. This is to test to make sure it floats. It should float as shown above. If it doesn’t float, you’re straw may have a hole in it. Try again with a new straw. Step 6 – Fill the two liter bottle with water. Make sure to fill it to the top, otherwise the experiment won’t work. Carefully place the diver into the bottle and screw on the lid. Step 7 – Squeeze the bottle and watch as the diver sinks to the bottle. Stop squeezing and he will float back to the top. 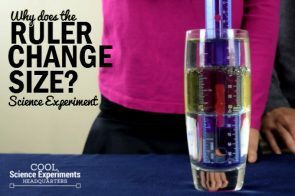 This experiment is also referred to as the Cartesian Diver Experiment and it is a simple and fun way to teach kids about density and how it impacts whether an object will float or sink. Squeezing the bottle forces the water up into the straw and compresses the air in the straw as well. This causes the diver to become more dense and therefore start to sink. When the bottle is released, the pressure lessens and the water moves back out of the straw. This causes the diver to become less dense and therefore float back to the top of the bottle. I hope you enjoyed the experiment. Here’s some printable instructions. Cut out your diver using the same shape and size indicated above. I lightly sketched my diver on my foil before I cut him out. Note: That is a small paper clip. The diver should be approximated an inch and a half tall. Cut the straw and position it on the paper-clip as show above. Each end should be secured by the ends of the paper clip. Slowly slide the straw onto the diver as show above. The diver should look like he’s wearing a scuba tank. Place a small piece of play-dough or putty on the diver’s feet. Fill a glass with water and put the diver in. This is to test to make sure it floats. It should float as shown above. If it doesn’t float, you’re straw may have a hole in it. Try again with a new straw. Squeeze the bottle and watch as the diver sinks to the bottle. Stop squeezing and he will float back to the top. 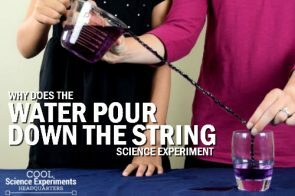 Science Experiments Delivered to Your Inbox Each Week! Fun experiments, video demonstrations, easy to print instructions and a FREE ebook. I’m looking for the pattern for the diver and I can’t find it on the website. Could you direct me to it or email it to me? Thanks for asking and for pointing out that it was difficult to find. Here is a link to download the template. I’ve also updated the instructions to make it easier to find. Have fun with the experiment! I’m having trouble getting the play dough to stick. Does blue tack or something else work better? I’d first try wetting the play dough just a little bit and then pressing it on the diver. That may do the trick. If not, blue tack should work or you could try silly putty. Here is a link to an list of simple experiments related to density. I hope it helps! I can’y get my scuba diver to go up it just sinks when I put it in!